Gary Bowyer says the postponement of Blackpool’s game against Northampton came at just the wrong time. The Seasiders are among the form sides in League One, having enjoyed an unbeaten February which saw them record impressive away wins at Wigan Athletic and Portsmouth. Pool were denied the chance of recording their first home win since October on Saturday, when they were due to take on struggling Northampton Town. That game was called off on Friday, and while Bowyer had no complaints with the decision, he says it was a shame his side weren’t able to continue their impressive run. He told The Gazette: “We were very keen for the game to be on because of the momentum we’ve got. “It was disappointing we couldn’t play but you saw the state of the country last week with the weather, so it was to be expected. “It suited everybody having the game called off early. The Charlton game recently was called off at a late stage and we saw the disruption that caused. “An early shout like this meant we could put plans in place a little bit. “You have to make the most of it. We gave the players the weekend off, which they very rarely get during the season. Bowyer says he was able to take in a number of games over the weekend, including Blackburn’s 2-2 draw with Wigan at Ewood Park. Bowyer will return to Rovers’ ground tonight to watch Blackpool’s rearranged FA Youth Cup quarter-final against Blackburn (7pm kick-off). The tie was due to be played last Wednesday but was postponed due to adverse weather. The young Seasiders go into the game against Blackburn’s Category One academy side as huge underdogs. But John Murphy’s team have seen off Ipswich Town, West Ham United and Southampton, so Bowyer says they will be full of confidence. 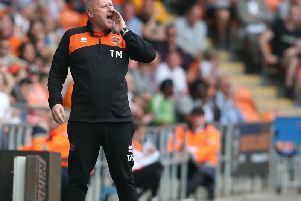 He added: “It’s a fantastic opportunity for them to have another good go, like they already have in the cup this season. “You only have to look at the teams they’ve beaten. To have reached the quarter-finals is an unbelievable achievement. “But knowing John Murphy, (assistant) Ian Dawes and the group, they will want to progress even further.